The South African Krugerrand was the first modern bullion coin issued with the purpose of allowing individuals to own gold bullion. Previously, bullion (as opposed to gold in the form of actual currency coins) was available to buy only in the form of bars. 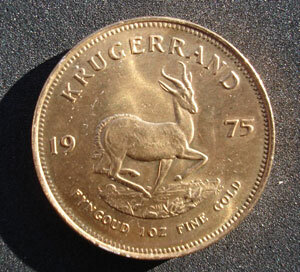 Krugerrands were first issued in 1967, and were immediately successful, mainly because they were in a convenient one ounce form, and because they were sold at a very low premium (originally 3%) over the international spot price of gold. The coins are minted and issued every year. The one ounce coin weighs 33.93 grams (1.09oz) , has a fineness of 0.917, and has 31.1 grams or exactly one troy ounce of gold. The weight difference is due to the fact the coin is alloyed with copper, to make it more durable and scratch-resistant when in circulation or when being handled. Half ounce, quarter ounce and one tenth ounce versions of the Krugerrand are also available, but are not as common as the one ounce coin. The obverse of the coin shows Paul Kruger (President of South Africa in the late 19th century), and the reverse shows the date of issue and a springbok. 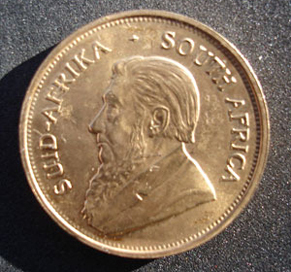 The Krugerrand, despite the difficulties caused by general economic sanctions against South Africa shortly after the coin was released, was wildly successful, and caused many other countries to copy the idea of a national one-ounce gold coin. Imitators included Canada with its Gold Maple Leaf, Britain with its Britannia, and the USA with its Gold Eagle. As with most gold bullion coins, there are now proof versions available, at a high premium.